This PlatinumTM Candle System from Hollowick is perfect for use in restaurants, banquet facilities or hotels. It features patented enhanced random flicker technology and the rechargeable nickel metal hydride provides 18 hours of candlelight from an 8 hour charge. The charging indicators are built into the charging tray - red indicates charging and green indicates fully charged. 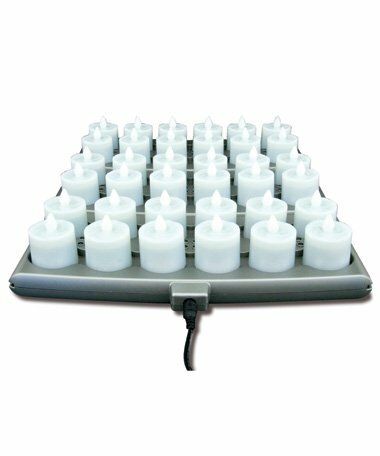 This candle system includes a power adaptor, charging trays and candles. Charging indicators built into the charging tray. RED indicates charging. GREEN indicates fully charged. If you have any questions about this product by Hollowick, contact us by completing and submitting the form below. If you are looking for a specif part number, please include it with your message.